Now that I've reached this certain age, lots of my friends are getting married, or having babies, or both. I like to make presents for them all, as it's more personal and charming. A year or so ago, I made a really awesome present for some friends who were expecting, it was an effective, and lovely present, that my friends loved and have been using ever since. A baby mat. I now make them for everyone, as they are just so pretty and practical. It's simply a brightly coloured, padded mat for the baby to lie on. 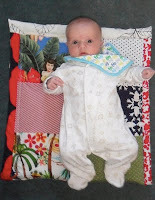 I use modern brightly coloured fabrics (100% cotton). The first two I made, I backed with this fabric, as I had an abundance of it (stupidly am running out now, I must restock). Recently, I've been using anything brightly coloured and fun. I love making them, so much. They are so pretty and give instant impact, visually and on a practical level. My friends had twin girls, so I made this mat for them, it's dimensions are: 38.5" x 23". It's back with the yellow floral fabric used for two of the squares. I'm hoping to get some up on my etsy account soon, in the mean time, if anyone would like one, I'll happily take on the commission. On average, they are 23" long and about 20" wide, but if you'd like them in a different size, colour, patterned or plain, etc. Please email me here.